Hand painted with that primitive country feel. Great for year round decorating in your kitchen or use as a winter decoration! Painted to bring warmth to your home by it's antiqued painted technique. I've painted on this milk chocolate brown ginger and accented with some stars and frosting! 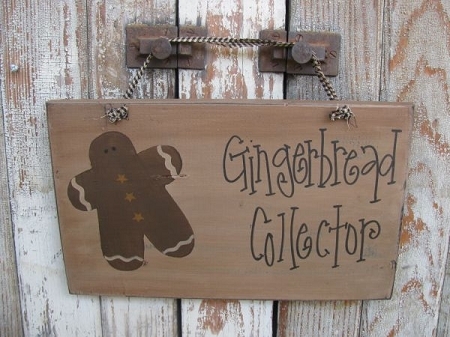 Then hand wrote GINGERBREAD COLLECTOR. Other sayings are available. The sign was hung using homespun fabric. If you'd prefer a sawtooth hanger, I can add that in place of the fabric. Choose your options below. Size of the wooden sign is 12"x7". Hand painted and signed by Heidi.